This collection contains several thousand images in all media and is often used to provide illustrations for lectures, books and exhibits. 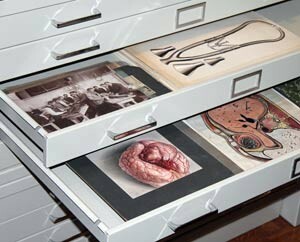 Photographs available include those of local medical schools and hospitals, their faculties and staff, diagnostic and surgical instrumentation (especially instruments in the collection of the Dittrick Museum of Medical History), and portraits of important individuals in the history of medicine. Copies of images in the collections are available, so long as there is no copyright infringement. Access to museum collections is by appointment only. We are digitizing collections by category and posting groups of images as we proceed.